It may not get much in the way of winter snow nor ice, but ice skating is a big deal here in Silicon Valley. The area is home to figure skating legend Kristi Yamaguchi and San Jose Sharks hockey is almost a religion. There are several places where you can go ice skating in Silicon Valley year-round, and others that are open only during the holidays. Here are the indoor and outdoor skating rinks that offer public skating. Most year-round facilities also offer lessons and hockey/figure skating team play. Belmont Iceland: An indoor ice skating rink with daily open rink public skating sessions and weekly specials including flat rate skating on Friday nights and a weekday lunch hour discount. 815 Old County Road, Belmont. 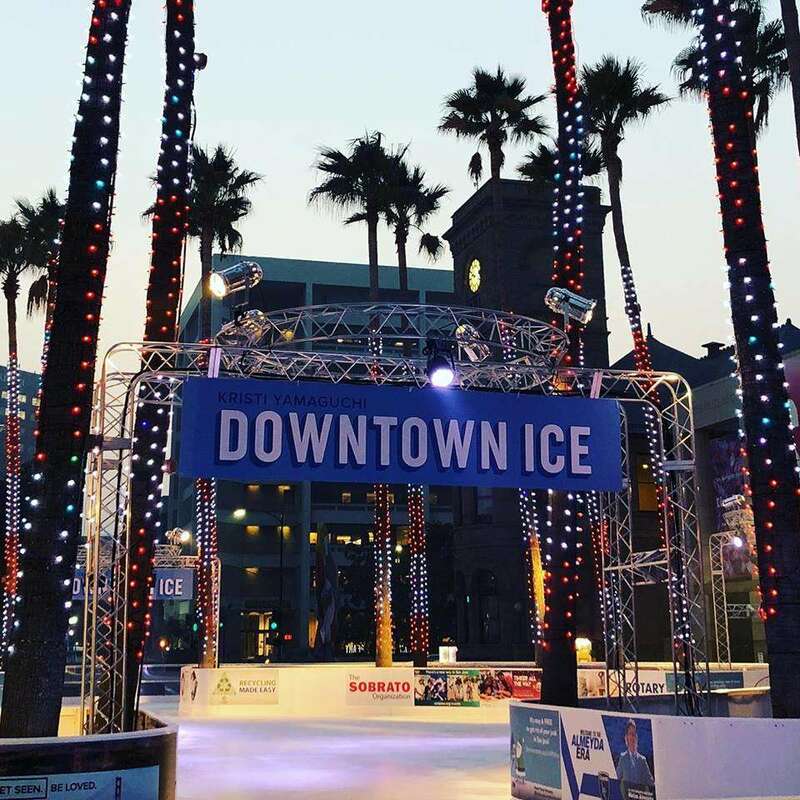 Downtown Ice: Go ice skating under palm trees! The Hawaiian Airlines Kristi Yamaguchi Downtown Ice is an outdoor skating rink in the heart of Downtown San Jose. Open daily, through February 7. Hours vary, check the website. Prices include skate rental. Circle of Palms, 120 S. Market St., San Jose. Ice Center Cupertino: A year-round ice rink with daily public skating sessions, summer camps, skating school, and private lessons. Varied pricing during the holidays. 10123 N. Wolfe Road, Cupertino. Nazareth Ice Oasis: A year-round, indoor ice skating rink that is mostly dedicated to team play and ice sports training, but it’s open to the public on weekends with limited public hours Monday through Friday. 3140 Bay Road, Redwood City. Santa Clara Ice at Central Park: A holiday outdoor ice rink in Santa Clara’s Central Park. Open daily through the winter. Prices vary, choose from either a 2-hour pass or an all-day skating pass. Central Park, Santa Clara. Sharks Ice at San Jose: The official practice facility of the San Jose Sharks. The rink is open to the public daily. Their special “Holiday Ice” event runs from November through January 3--ice skate to your favorite holiday music with a special visit from Santa. Visit their Pro Shop for a variety of hockey and figure skating equipment and team memorabilia. 1500 South 10th St., San Jose. Winter Lodge: Outdoor ice skating on the only permanent outdoor ice rink west of the Sierras. Outside Magazine ranked it one of the top 10 outdoor ice skating experiences in the US. Daily public skating sessions. Closed December 24-25 and January 1. 3009 Middlefield Rd., Palo Alto.